Speaking at the inauguration of a memorial and cultural center in Guadeloupe devoted to the history of slavery, French President François Hollande evoked France’s “debt” toward its former slaveholding colony of Haiti but also appeared to reject the idea of monetary reparations. 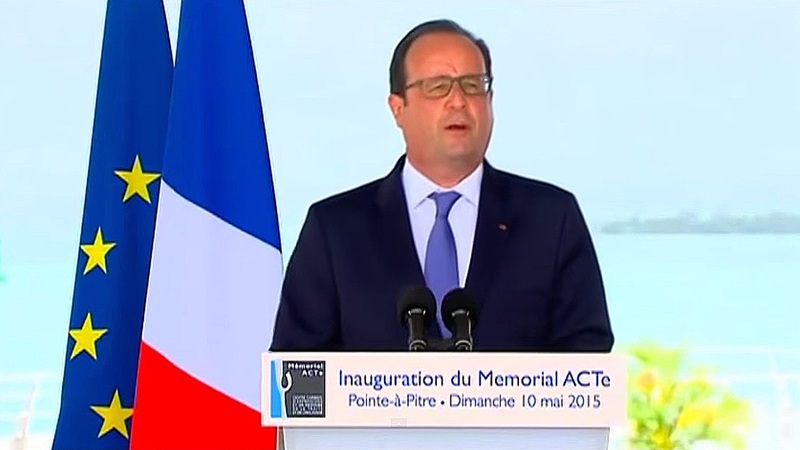 “When I go to Haiti, I will, for my part, handle the debt that we have,” Hollande said to loud applause. But later in the same speech he cited a famous French Caribbean writer’s objections to financial reparations. After stopping in the French overseas territories of Guadeloupe and Martinique, Hollande is slated to visit Cuba on Monday and Haiti on Tuesday. France has faced calls to pay the latter nation billions of euros in reparations — a sum that approximates the amount Haiti paid France after slaveholders demanded compensation for loss of property. Haiti, which became the world’s first black republic after winning its war of independence in 1804, agreed to pay the debt in exchange for official recognition from France in 1825. Critics say the so-called independence ransom was illegal from its inception, since France had already outlawed slavery by the time it asked for compensation. In 2010, then French President Nicolas Sarkozy visited Haiti in the aftermath of an earthquake that killed upwards of 100,000 people. That marked the first visit from a sitting French president in the nation’s history. Although France agreed at the time to cancel Haiti’s 56 million euro ($81.2 million) debt, it rejected demands from activists to pay 17 billion euros in reparations. In 2001, France passed a law that recognized the slave trade and slavery as a crime against a humanity. In the same speech in Guadeloupe, Hollande blasted modern-day “slave traders” in the Mediterranean, criticizing smugglers who profit from “human cargo.” Last year, more than 200,000 refugees, mostly from Africa and the Middle East, attempted to cross the Mediterranean Sea to Europe. More than 3,000 of them died.